Ashgabat, the capital of Turkmenistan and Parthians' ancient capital, is seated at Nisa among the ruins of the Silk Road. 400,000 live in Ashgabat's valley at Kopet Dagh foothills and by Kara-kum desert. This former military fortress became a town in 1885. According to folklore, Ashgabat translates to "a city of love". In legend, Nurahmed ruled Nisa while Pirahmed ruled Anau. The love between their daughter and son caused them to hide in the desert because of Allah's ban. Parched, they found evaporating springs. The young man's digging for upset Allah, but his messenger Azrail, saw the girl, fell in love, forgot the mission, and saved the couple's lives. AshgabatAshgabat, a city of love, features both traditional and modern architecture. Renamed Poltoratsk in 1921, Askhabat became Ashkhabat ("the city of love") in 1927 and Ashgabat in the '90's. Its flourishing trade and transportation were devastated by an earthquake that took 110 thousand lives and closed the city for five years in 1948. The Soviet Union restored Turkmenistan's capital but did not preserved the historical monuments. Today politics, science, and industry thrive, along with a university, colleges, theatres, museums, and more. The new National Museum houses valuable finds including traditional crafts and folk art from the 17th - 19th century. The Capital Carpet Museum displays many carpets from the 17th century, along with the world's biggest carpet measuring around 400 square meters and weighing more than a ton. The National Museum of History and Ethnography has Turkmenistan artifacts unearthed from Old Nissa. 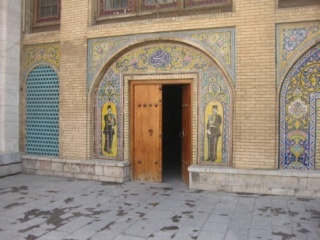 The Arch of Neutrality stands majestically with a gold statue of Turkmenbashi on the top. Other attractions include the Presidential Palace, the building of Medzhlis, the Academy of Sciences, the Academic Drama Theatre named after Mollahnepes, Bairam-Khan monument, Lenin Square, Mekan Palace, the Conservatory, Alexander Nevsky Orthodox Church (19th century), the Ertogrulgaz mosque, and more. 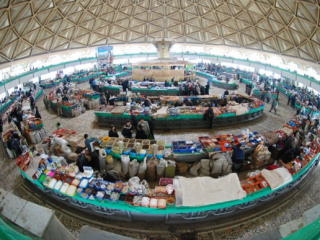 Many goods and traditions can be found in "Tolkuchka", a second-hand market that is open on Sundays. Over just few kilometers, eager bargain hunters can purchase traditional Turkmen carpets. The ruins of ancient Parthian state's capital Nissa attract tourists, archeologists and historians from all over the world.